It is a fact that operating cranes and hoists is a very dangerous occupation. It is known to severely injure and kill several people every year. This is why it is important that you should consider all the safety precautions when working with cranes and hoists to prevent accidents and to maximize operations. The first thing you should consider when operating these machines is the environmental condition. If certain conditions can harmfully affect the crane and hoist operations, such as corrosive fumes, excessively high or low ambient temperatures, and locations with high traffic of vehicles or people, it is important that you should consider stopping the operation and continue when the condition is favorable. The next thing you should consider is the location of the crane and hoist hook. Carelessness in operating crane and hoist equipments has known to severely injure and kill people. It is important that the crane and hoist operator should have coordination with a ground crew regarding the position of the crane and hoist. Warning devices are also preferable to notify people about the hook movement. It is very important that the whole crew knows about the crane and hoist’s movement by giving them a warning. You should consider that construction sites can be a very noisy place. This is why it is important that crane and hoist should have a warning signal that will enable workers to see or hear where it is operating. Ensuring the load is also critical. People have been killed and severely injured because of falling debris. Since a crane and hoist’s job is to carry heavy materials and move them from one place to another, it is extremely important to secure the materials on the hook so it won’t fall off. The materials should also be balanced to avoid swaying. Before operating a crane and hoist, the operator should inspect every part of the crane and hoist. It is important that everything should be in place and in perfect working condition before your operator should even start the crane and hoist. 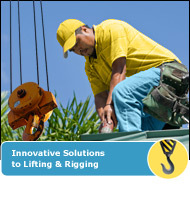 After inspecting the crane and hoist, your operator should then inspect the rigging equipment. Since safety is the issue in operating a crane and hoist, the operator and everyone in the building crew should wear at least standard safety equipments, like goggles, hard hats, gloves, boots and other safety equipments. The area of operations should be clear from other personnel in order to have safer and more efficient lifting operation. The area that will be operated should have warning signs, like caution tapes, cones or posting personnel. This will keep unwanted people out. When the crane and hoist is actually lifting equipments, the operator should never leave it hanging for any reason at all. It is important that the operator should set the load down first in a stable position and should be detached from the hook before leaving. However, sometimes maintenance problems can stop the crane and hoist from operating and may stop with loads hanging above the ground. If this is the case, the operator should contact their supervisor and clear the area below where the loads are suspended. It is very important that no one should be allowed to pass underneath where the load is hanging. These are some of the things you should remember when operating a crane and hoist. It is important that you realize the importance of caution and safety to protect you and your crewmen while the crane is operating. Steven Merusi writes about amerock hinges [http://www.amerockhinges.org] and belwith hinges [http://www.amerockhinges.org/belwith-hinges.php].